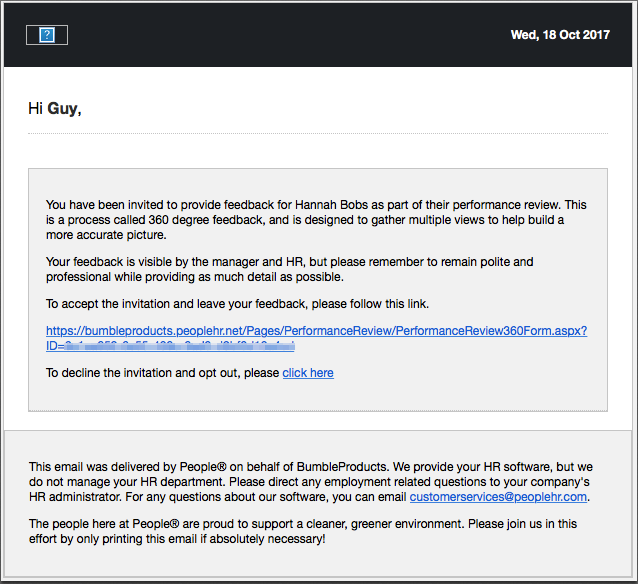 This article explains how an employee would submit 360 feedback for their college, upon invite. Once selecting the link to accept and answer these questions, you'll be taken to the 360 form online. The form will state who the review is for and also the review date. You can then proceed to fill out the review. Each segment will include a number of questions and a text box to answer, you may also have a number rating system. Admins and the employee's manager can view this feedback. The system does not allow the employee to view this information. However there may be an internal process in your company that may mean managers would show the employee this feedback during their face to face review. If you are unsure, discuss this with your manager to see if this is the case. Once you have answered all of the questions in the form, scroll down and click on 'Submit'. This will send an email to your manager stating you have completed this.